For those of you not familiar with the Ash franchise by SRRN games, this includes myself, Ash is a full length RPG designed exclusively for iOS. 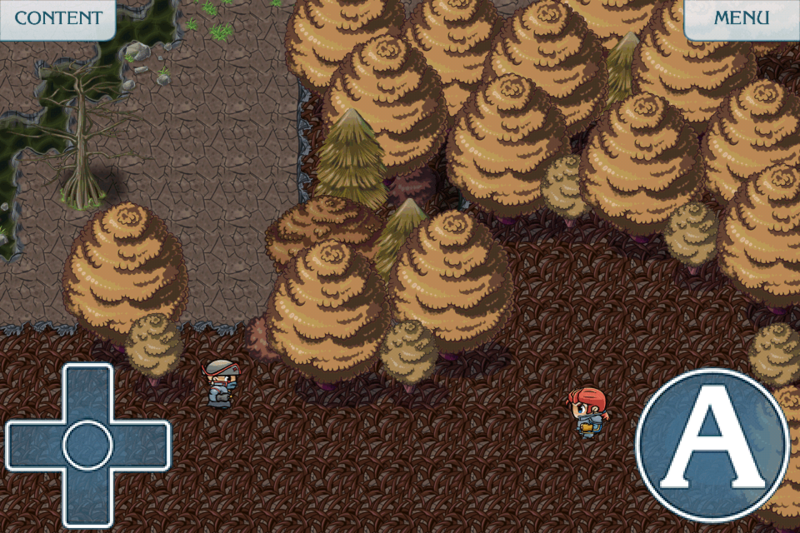 Ash II: Shadows follows this tradition, creating an episodic game for both iPhone and iPad. Unlike the original, this time around SRRN have had a little financial backing from heavy hitters Konami. Oddly, there are two versions of the game – gold and silver. The Gold edition (reviewed) will include all future chapters, while the Silver edition will require players to pay for the future chapters. Multiple versions aside, the game is essentially the same. Same story, same game play, just a little more costly depending which version you dish out for. 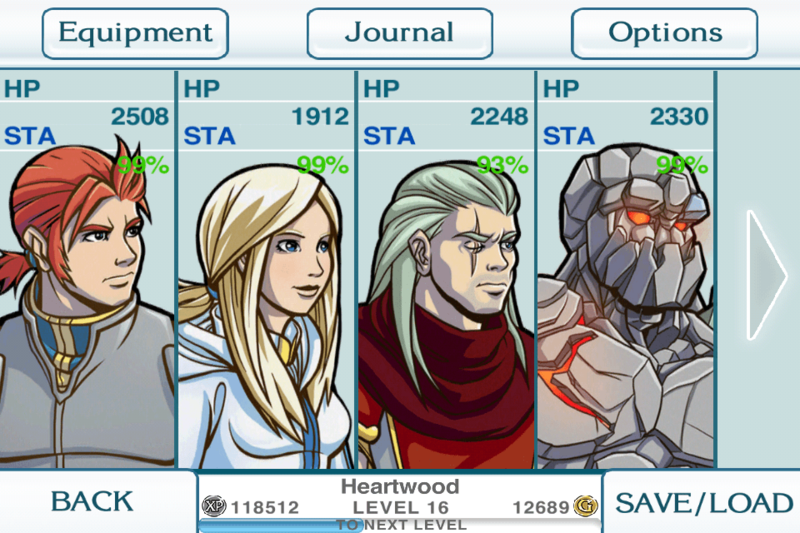 Ash II: Shadows plays like a typical RPG. 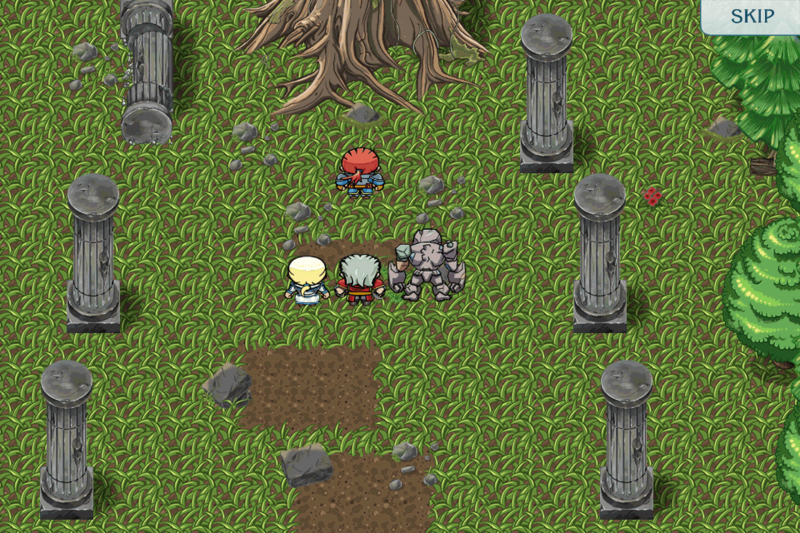 Your band of heroes wanders a magical land, sporadically encountering enemies as you progress. Enemies and towns are signified with smaller versions on themselves, what may look like a sand castle is actually a huge fortress full of twists and turns and even more enemies. Similarly, one snake could turn out to be a giant serpent and two bears – all of which think it’s reasonable to attack your heroes. This type of gameplay takes the emphasis away from the creation of a huge sprawling world and makes you focus down on the raw mechanics. Encountering enemies calls for a battle, which in true RPG fashion is turn based and allows you to flee or fight – using magic or might. As you progress and grind your way through the game you’ll eventually level up and also encounter new weapons along the way. These gameplay elements work rather well; they aren’t anything special but will keep RPG fans playing. 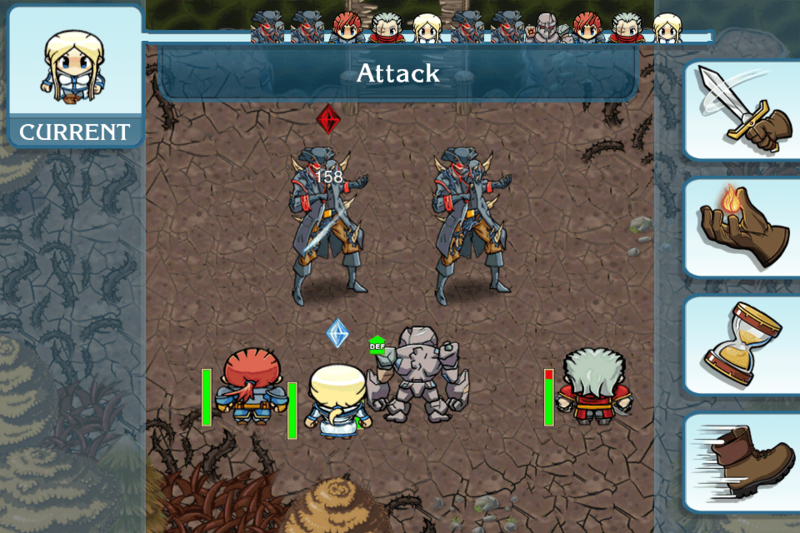 My one complaint would be the rather dull battle interface and probably that it is a little too easy to gain victory in the battles for my liking. But with any good RPG what keeps you playing for hours and hours is the story. With hours and HOURS of gameplay hidden deep within this small App, does Ash II: Shadows have the story to keep players engaged from start to finish? 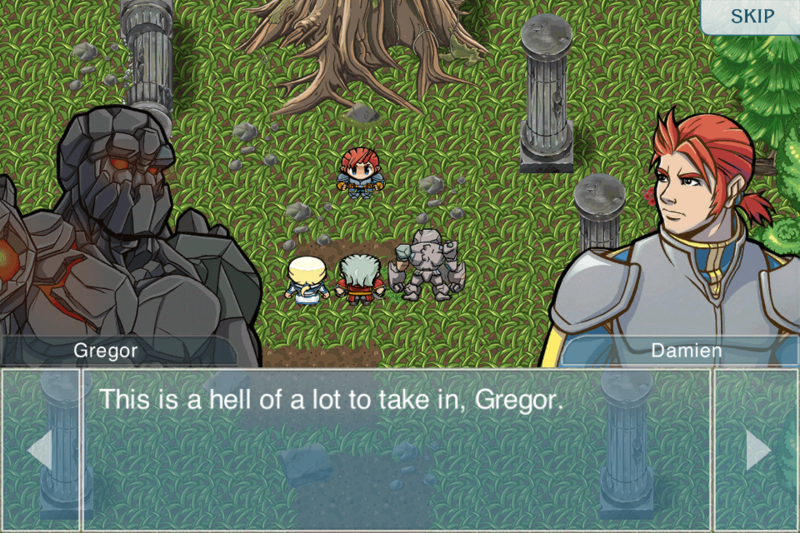 The basic plot of Ash II: Shadows follows a similar formula to a lot of RPGs. The magical world of Aghaus is in peril and can only be saved by the heroes of old. Nicholas, Damien and Yuka set out on a quest, eventually gaining new members to the party as they progress on their journey. The heroes are investigating an evil force known as the corruption, which is spreading its way across the land. The story progresses at a rather fast pace, often laced with some odd choices in humour that don’t help you in your understanding of the seemingly never-ending story. Of course, the mystery is there to keep you playing, but at times the lack of being fed information can be a little annoying. That being said, there are very few engaging and original narratives in the App store – for this Ash II: Shadows, SRRN games and Konami should all be commended. With the huge flux in what, I guess, can be deemed as ‘retro’ games be ported to iOS, ‘retro inspired’ games have began to spawn in an attempt to gain popularity and climb the ranks in the App store. It’s a bold move, yet one that SRRN was willing to take again on Ash II. The graphics are rather simplistic, especially when venturing across huge open spaces and enemies and cities are converted to small sprites or landmarks no bigger than your own sprite. The characters are all well crafted – a unique blend between pixelated sprites and high definition hand drawn characters. Characters are brought to life even more during moments of dialogue, featuring detailed portraits of our heroes, and other talking characters spread throughout the game. The downfall here is that they retain the same facial expressions throughout, which becomes a little odd during those scripted moments where humour is being used. A little variation between expressions would not have gone unnoticed, but given the length of the narrative and the pending release of more chapters it makes sense to take it easy on the App size in terms of visual complexity. It took a little while to warm up to the unique visual style of Ash II: Shadows, but in the end I began to appreciate it for the beautiful title that it is. If there is one element of Ash II: Shadows to be praised, it is the audio. Orchestral scores play throughout the game – from the title screen, changing and altering with new area you enter. The sound effects range from a turning of pages when skimming through dialogue to battle sound effects when fighting off enemies. While the sound effects may be a little intrusive at times, this is only because the background sound tracks are so ambient, engaging and well composed that it’s a shame to have any distraction from them what so ever. With an original story, despite it being a little lacking in complex information, and simplistic gameplay Ash II: Shadows is a must for any iOS wielding RPG fan. The graphics are a unique take on a popular genre – combining HD graphics for the iPad and iPhone 4 series with a ‘retro’ feeling style of modeling and level design. Held together with impeccably composed audio, this game has almost everything. However, the title can often sit on the cusp between great and mediocre, with the need to buy episodic installments in the silver edition a little off putting. Ash II: Shadows might not win new comers over to the RPG genre, but fans of this game type, and indeed fans of the original Ash will enjoy this title.